Nestled in the treetops, the “Love Shack” — which is anything but shack-like in appearance—brings modern residential architecture lines to the wild beauty of nature in North Carolina. A unique example of sustainable architecture and contemporary design, this custom modern home blends Phil Kean Design Group’s award-winning aesthetic with the homeowner’s vision for a peaceful, natural retreat. Located on a high-ridge site surrounded by sycamore, basswood, oak and yellow poplar trees, one of the biggest challenges presented during the modern home’s construction was minimizing environmental impact while making the most of the sloping site. Consulting renowned arborists in order to protect and preserve the surrounding woodland, the home was built on a limited footprint of just 600 square feet, adding livable space in the form of three stories plus a loft. 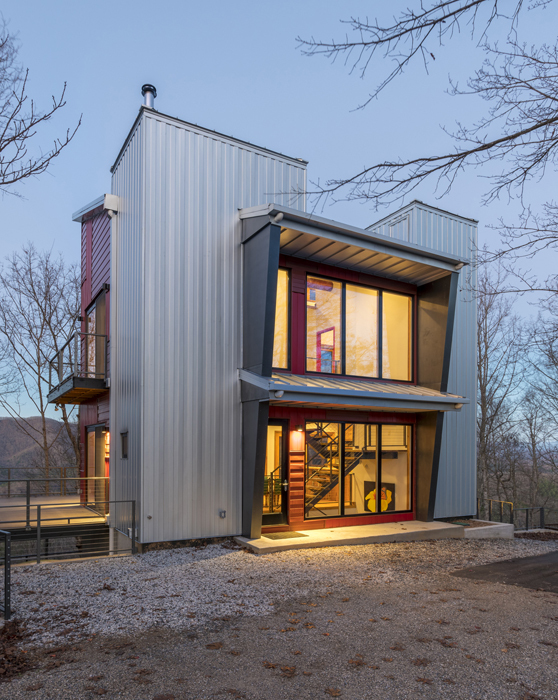 This vertical approach reduces the structure’s impact on the surrounding forest, while still providing the homeowners with the luxury house and open living space they had envisioned for their mountaintop retreat. Breathtaking landscape views encapsulate the home from every angle, with 30 miles of the Blue Ridge, Smokey Mountains, Lake Fontana and lush, green forestry visible through floor-to-ceiling windows and glass doors. Stepping into the home is a complete sensory experience, with striking surroundings at every turn, a large balcony porch to enjoy the fresh mountain air on, and recycled wood used throughout the cabin to further blend the outdoors and the indoors into one naturally beautiful creation. In keeping with the home’s ultra energy efficient vision, Zola Thermo Clad windows and doors were used throughout the Love Shack. These energy-conserving additions helped the home meet strict green design codes while remaining a striking and functional part of its overall modern design. Sliding glass doors and tilt-turn windows, also by Zola European Windows, were incorporated into the home, making up integral parts of the Love Shack’s unmatched eco-chic aesthetic. Learn more about the Love Shack and read an interview with the homeowner, Ken LaRoe, and architect, Phil Kean, on the Zola European Windows website.